I’m writing this post at the tail end of a long cold winter. Our visit to Imminent was in autumn and looking at the photos our mindset was apparent. It wasn’t warm out, 51 degrees, but we weren’t ready to call it quits and accept winter into our lives. It’s why we agreed to grab a spot on the patio and enjoy one last glimmer of hope. We sat beneath a propane heater at a barrel that was converted into a high top table. The patio borders the sidewalk and contains a bunch of seating. If it wasn’t for the weather I’m sure it would have been packed! Parked right on the patio was a food truck. There is a gate that can be opened and the truck can pull right in. Neat! 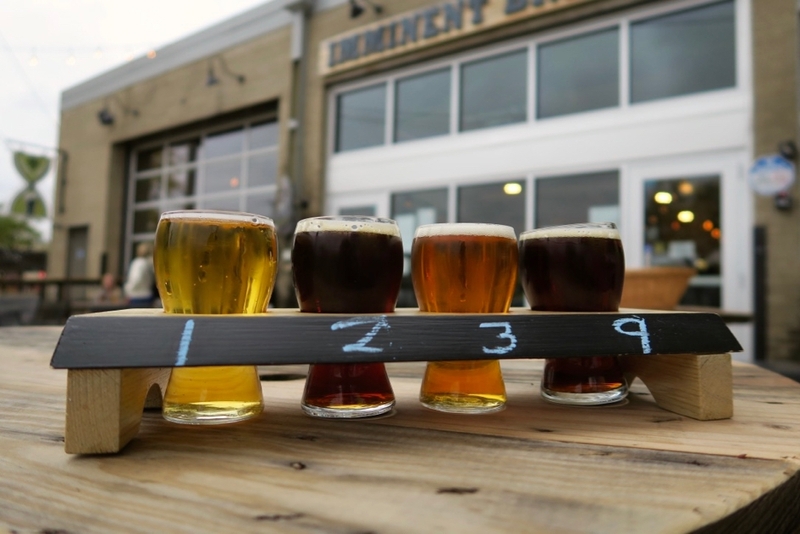 The Imminent taproom is located in a light brick building that was formerly a National Guard Armory. 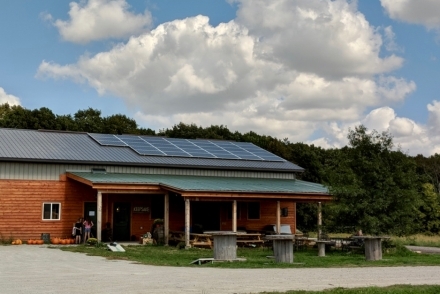 While they don’t occupy the entire space, their taproom takes up a majority of one end. 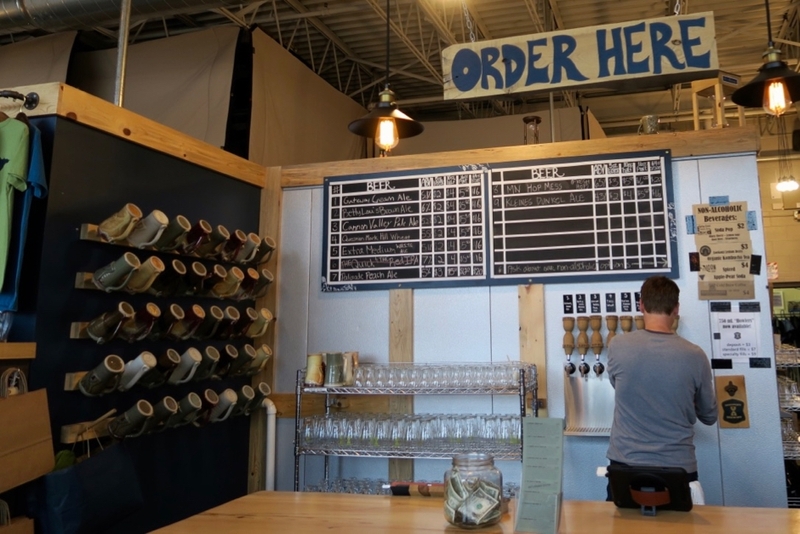 Right as you enter is a bar, their tap list, and an “Order Here” sign. To the left of the tap list are a collection of stoneware mugs. 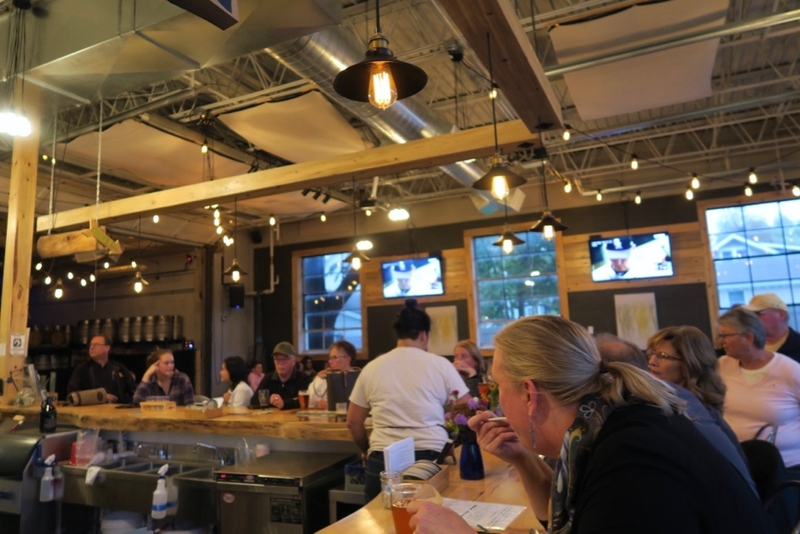 The bar wraps around the right where the bulk of the taproom seating resides. Two large glass garage doors flank the main entrance which results in an a wealth of natural light. At the end of the main seating area is a small stage with their production area as its backdrop. 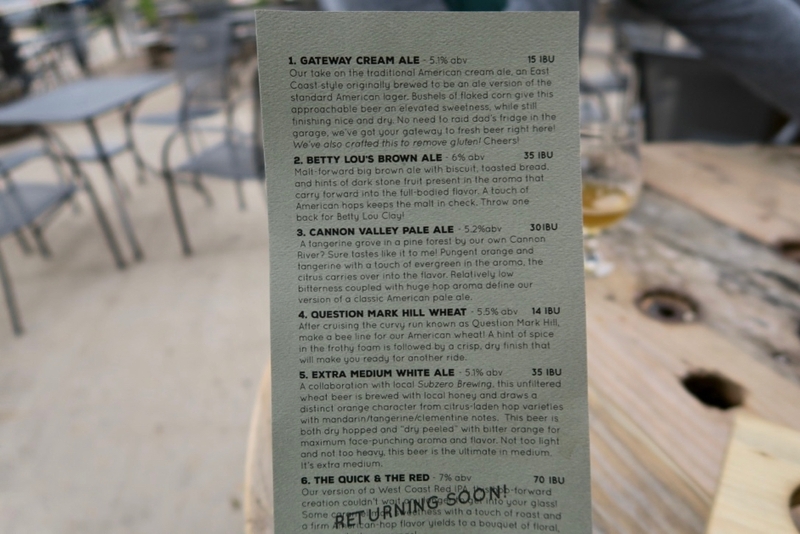 As usual, I ordered a flight of four beers: Gateway Cream Ale, Betty Lou’s Brown Ale, Cannon Valley Pale Ale, and Kleines Dunkel Ale. I followed that up with a pint of Extra Medium White Ale. 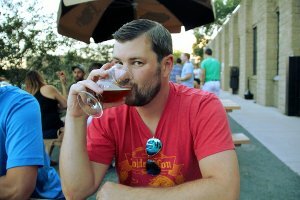 The White Ale was easily my favorite, slam dunk. It was citrusy with notes of orange and mandarin, nice and clean with a full hop profile. I was really happy with it! On the flip side of the coin, something was definitely wrong with my Dunkel. It was hard to pinpoint with my taster but there was a heavy green apple flavor to it, a telltale sign of acetaldehyde. 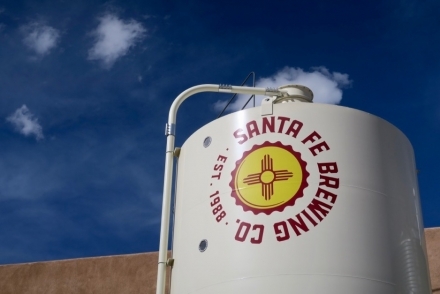 This is a common off-flavor in beer that some people think contributes to hangovers. 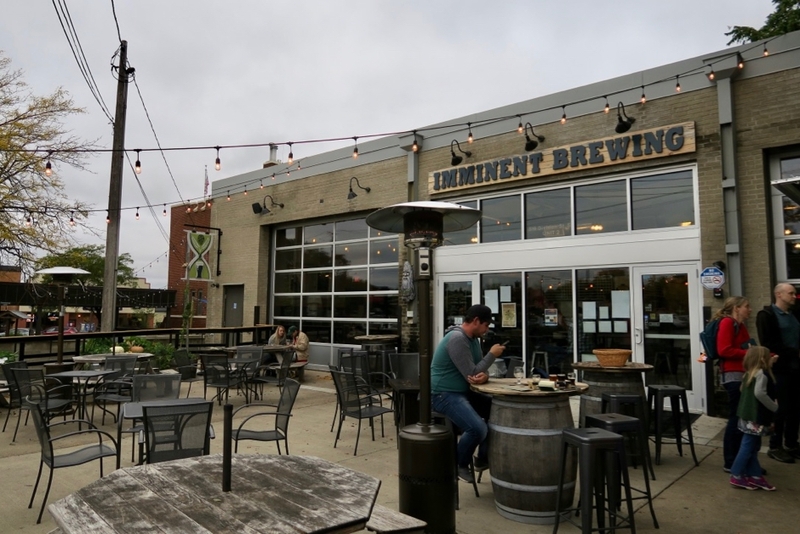 Despite the single bad beer, I would visit Imminent Brewing again. With nine beers available during our visit and enough taps for a handful more I’d be willing to try a fresh set to see what they’ve got now. During our visit the interior was absolutely packed, and a handful of patrons spilled out onto the patio for lack of choice. 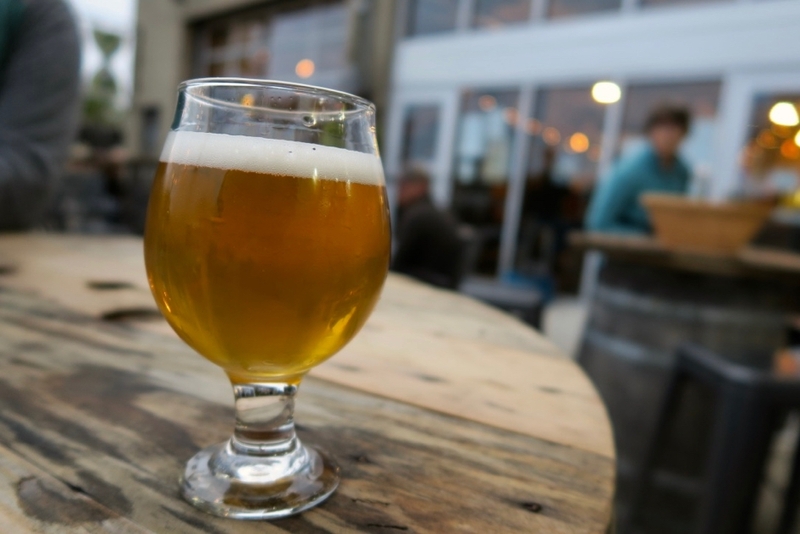 The taproom is charming, and on a warm summer evening there is probably no better place to enjoy a drink in Northfield, Minnesota. 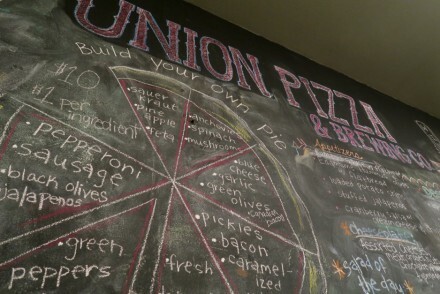 Union Pizza & Brewing Co.